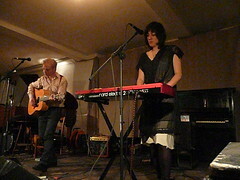 I arrived at Cafe OTO shortly before opening act Amor de Dias took to the stage. The venue was already fairly crowded so I shuffled in and found a spot near the front but tucked in behind a pillar. Most of the folk around me were sitting so I felt a bit conspicuous but held my ground, reasoning to myself that if I wasn't obstructing their view the pillar would be. Amor de Dias is the new project of Alasdair MacLean of The Clientle and Lupe Núñez-Fernández of Pipas. They played a short but very beautiful set of tropic-tinged folk guitar music accompanied on a couple of tracks by "Anne" on a huge recorder. Alasdair introduced the first track as "someone born in Aberdeen trying to play guitar like Caetano Veloso." I think a couple of the numbers were tracks from Bonfires on the Heath, the new album by The Clientele coming out next month. This must have been the fourth or fifth time I've seen The Left Outsides, they seem to be pulled in to support most bands I go and see these days. They make a lovely sound although they struggled a little tonight and the set seemed short and not as sweet as usual. Still lovely... just not as lovely as I know they can be. Maybe my appreciation was coloured by the time (more of that later). Before Damon & Naomi took to the stage I had a chat with Joakim who was over for the show with his girlfriend, who was too shy to say hello (which as someone who has often been too shy to say hello I completely understand - so this is by way of a "hello" to her now). They knew of me through A Head Full of Wishes and under the name "And Suddenly" had contributed a lovely lo-fi cover of Luna's "Tiger Lily" to the Decomposing Trees tribute CDR I'd released many years previously (and still available to download for free here). I can't help get a warm buzz when I think of all the nice people I've met through AHFoW. By now I was checking my watch obsessively. Leaving my bike at Acton Central meant that the only way I would get home at anything approaching a reasonable hour would involve me catching the last train west from Dalston Kingsland... that train left at 23:03 and Damon & Naomi never started until almost 22:10 so I was already resigned to having to skip out before the show ended. Obviously a real fan (or at least a younger one) would have shrugged off the thought of a late night and worried about getting home after the show was over. But I've reached a stage in my life where getting home easily, quickly and as early as possible seemed more important. Damon & Naomi opened with Song to the Siren and played through a set mixing tracks from their Sub Pop years with more recent tracks. Highs, and it was all up there, were New York City, which never fails to move me and Lilac Land. But by now time was getting on. In my head I was trying to work out how long it had taken me to walk from the station... how long... then Damon & Naomi, as if hinting that I was cutting it fine, played "How Long." They finished the song and I bolted for the door, passing Alasdair who I assume was heading for the stage and a guest appearance. I paused at the door for a second and then left... ran to the station and had a five minute wait (at least one more song) before the train showed up. The journey home was uneventful except that I learnt from The Sub Pop Years liner notes that Song to the Siren was a fake live album! A lovely evening but annoyed that I couldn't see the whole show. If anyone cares to fill me in on what I missed... please do... just don't make it sound too great because I'm miserable enough already!